United Treatment Centers, Inc. Announces Media Contract With Quorum Productions, Inc.
ASTORIA, NY--(Marketwire - October 26, 2009) - United Treatment Centers Inc. (PINKSHEETS: UTRM) announced today the partnership with Quorum Productions, Inc., a wholly-owned operating subsidiary of O2 Media, Inc. O2 Media, Inc. is a production company that is nationally renowned for creating award-winning educational programs. Quorum Productions has selected the Aquafree™ waterless toothbrush, above all other oral care products, to "star" on a feature story entitled "Innovations in Oral Care." As a result of their talented staff and quality productions O2 Media has won numerous Telly and Davey awards. In the 28th annual Telly awards alone, O2 Media, Inc. companies came home with an impressive 19 awards for the Designing Spaces television series. Quorum's shows are geared towards disseminating vital solutions to everyday challenges and helping them make important decisions which impact their lives. Guests on Quorum Production television shows have included representatives from companies such as Microsoft, MTV, Warner Brothers, Morgan Stanley Chase, Disney, Procter & Gamble, Celebrity Cruise Lines and many others. Quorum Productions, whose mission is: to Educate, Empower and Entertain, has selected Aquafree™ waterless toothbrush, above all other oral care products, to "star" on a feature story entitled "Innovations in Oral Care." 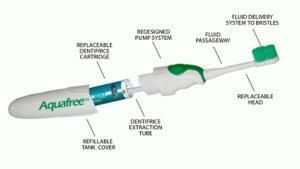 The Aquafree™ toothbrush (www.aquafreetoothbrush.com) is a new and innovative, environmentally-friendly product that does not require water. There are over 2 billion people in the world that do not have access to sanitary water. It is UTRM's mission to make water conservation practical and convenient. Using the Aquafree™ toothbrush is an effortless way for anyone to make an impact on the earth's water supply while gaining the added benefit of getting one's teeth 35 percent cleaner than traditional methods. Beyond the obvious water conservation benefits, the Aquafree™ toothbrush is especially attractive to those in the military, campers, travelers, and to those who do not have clean water readily or conveniently available. The Aquafree™ toothbrush will appear on their new miniseries, Beauty Spaces, during their first quarter programming . Beauty Spaces distribution of the segment will include a minimum of 20 airings through a combination of any or all of the following networks: The Learning Channel (TLC), Women's Entertainment (WE), Lifetime Real Women, and Network affiliates for: ABC, NBC, CBS, FOX, PAX and UPN, with the potential of reaching 80 million households. Additionally, prior to the actual airing of the segment, Quorum Productions will be promoting the show in various print ads, press releases, newsletters, and social networking sites. Their time-tested and successful marketing techniques are a result of their targeted and creative approach. When promoting a program to a national audience, their advertising and PR departments collaborate to publicize their program message in exciting and innovative ways. Todd Spinelli, Vice-President of UTRM, said, "We couldn't be happier about being selected by Quorum Productions to feature our Aquafree™ toothbrush on their Beauty Spaces miniseries. After touring their studio and meeting their staff we are looking forward to working with them now and in the future. Quorum Productions has already indicated the desire to have follow-up segments featuring the Aquafree™ toothbrush and the success of the company." Frank Ottaviani, President of United Treatment Centers, said, "We are very pleased to work together with Quorum Productions in building consumer awareness of our innovative waterless toothbrush. It is always a challenge to launch a new product into the marketplace, but we are developing a comprehensive marketing plan to build sales momentum quickly with creative partners such as Quorum Productions." For more information on UTRM's AQUAFREE™ Product line, please call 1-877-AQUAFREE (1-877-278-2373) and leave off the last "E" for our Environment. To be included in the company's database for company updates, press release and industry developments, investors and shareholders should send their e-mails to IR@unitedtreatmentcenters.com. About United Treatment Centers, Inc. This document includes certain forward-looking statements within the meaning of the Private Securities Litigation Reform Act of 1995. These statements are based on management's current expectations or beliefs, and are subject to uncertainty and changes in circumstances changes in economic, business, competitive, technological and/or regulatory factors. Investor Relations and Media Relations for United Treatment Centers, Inc.